Soaked macadamia nuts give this vegan yogurt an ultra-creamy texture. 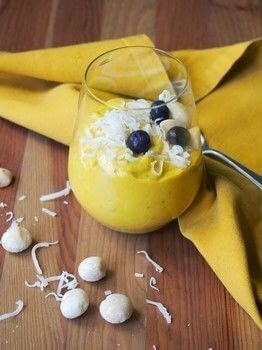 You can make this with any fruit you like, but I love the beautiful color created with mango and a pinch of turmeric. Mix chia and water and let sit 10 minutes to gel. Once gel has formed, add chia mixture, mango, soaked and drained macadamia nuts, tumeric, orange juice, lemon juice and maca powder to a food processor. Blend 2-5 minutes, until thick and creamy. Serve garnished with shredded coconut, berries or nuts or store in individual portions in small mason jars.